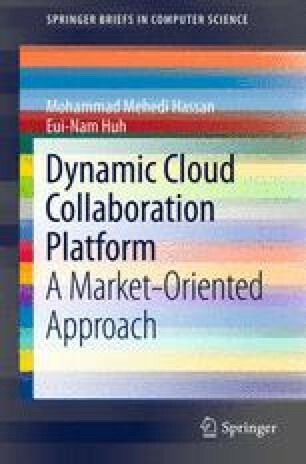 In this chapter, we present our evaluation methodology and simulation results of the utility of dynamic cloud collaboration (DCC), MOGA-IC for CP partner selection and proposed CACM model. First, we compare DCC platform with existing cloud federation model. Then, we present the comparison of the proposed CACM model with the existing CA model in terms of economic efficiency. Next, we present a simulation example of a partner selection problem (PSP) for a pCP in the CACM model. It is used to illustrate the proposed MOGA-IC method. NSGA-II and SPEA2 are utilized to develop the MOGA-IC. Further simulation examples are conducted to pinpoint the most viable approach (NSGA-II or SPEA2) for MOGA-IC. Moreover, we implement the existing MOGA that uses only INI called MOGA-I for CP partner selection and analyze its performance with MOGA-IC in the proposed CACM model. Finally, numerical results are presented to demonstrate the utility of the price minimization algorithm among cloud providers in the CACM model.